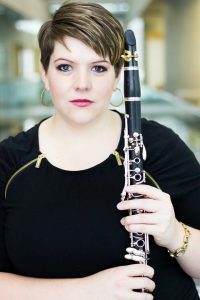 Dr. Aubrey Shirts is a DMA graduate from the University of Utah in Clarinet Performance, with an emphasis in Music Education. Dr. Shirts earned her Bachelor of Music Education at Southern Utah University and her Masters of Music at the University of Utah. Aubrey currently oversees the clarinet studio at Southern Utah University and teaches at Dixie State University. Dr. Shirts also teaches private lessons at the Resonance School of Musicianship in St. George. Aubrey’s most recent performances include playing in the pit orchestra for the Tuacahn Center for the Perfroming Arts and as a member of the Southwest Symphony Orchestra. Dr. Shirts has presented at the Utah Music Educator Association’s Mid-Winter Conference and the Las Vegas Clarinet Day Festival. Aubrey’s experience at the University of Utah included playing in ensembles, directing the Clarinet Choir, and teaching woodwind methods and music education classes. Prior to working on her graduate degrees, Dr. Shirts was the Director of Bands at Layton High School and Piano Area Choir for the Salt Lake School for Performing Arts. Aubrey’s professional playing experience includes the Utah Shakespeare Festival, Tuacahn Center for the Arts, and the Neil Simon Festival. Dr. Shirts’ former clarinet teachers include Dr. George Stoffan, Dr. Holly Haddad, Dr. Virginia Stitt, Professor Greg Johnston and Professor Kathy Pope. Aubrey’s previous piano teachers were Dr. Kirill Gliadkovsky and Dr. Christian Bohnenstengel.